1. The screen, for it’s size, is great. It’s clear, it’s sufficiently bright. I wish it had a retina display, but this isn’t holding me back. 2. 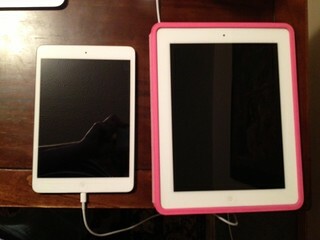 The iPad Mini is light. Super light. Wicked light. The difference is like the difference between a Macbook Pro and a Macbook Air. I love this about it. 3. If you read a lot of books, I highly recommend the iPad Mini. The size is very similar to that of the second generation Kindle. The weight of it is great for holding in one hand as you read. If you game or watch a lot of video on your iPad, get the 4th generation iPad with retina display. 4. The new speakers on the iPad Mini rock. 5. Battery life is just as great as it was on my iPad 2, maybe even a little bit better.